I had the most beautiful lawn in summer. People stopped to say they have never seen such a green blanket. It was thick and lush. And now, wow, I have hardly anything left. It is just dying and I am really stressed about it and would like to know if there is anything I can do to get it right. I have no idea what I can put on it. Please help me. 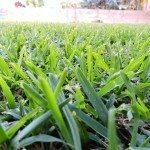 Here is a link with lawn care information and you can try to pinpoint the issue.